If you’re planning a trip to the region of Umbria in Italy, add Assisi to your list of day trips. 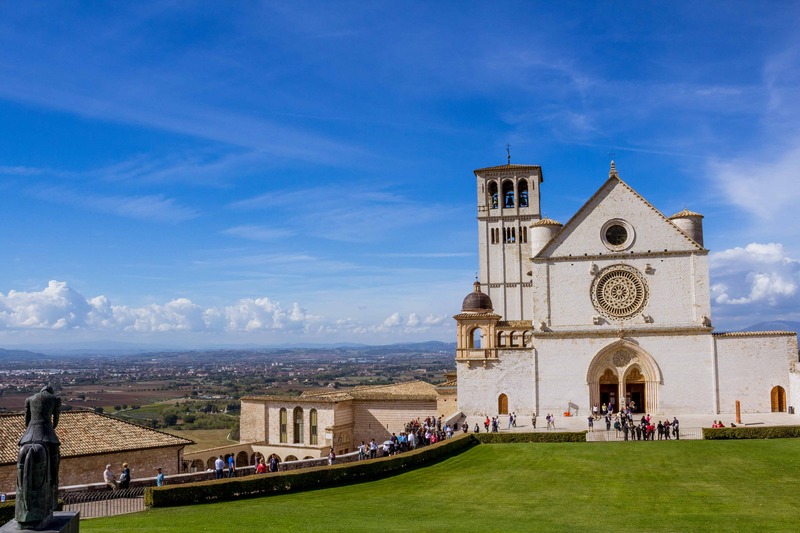 This post lists 8 sights you must see in Assisi. For a week in October 2017, my husband and I stayed at le Torri di Bagnara in the region of Umbria, Italy, for our destination wedding. Twenty of our closest friends and family stayed at the villa with us, giving everyone a chance to explore Italy. We chose Assisi as one of our day trips. (He actually went on Sunday with a group of our guests when I chose to hike the estate, so he went twice). We went with two of our guests and spent most of the day roaming the streets and enjoying the beautiful weather, architecture, and views. Parking is outside of the Town walls or near the Amphitheater. When getting there by car you can park in the Piazza Matteotti parking lot. to reach the “cave”. You can also park in the Porta Nuova parking garage. Then you can then ride the escalator up to the city gate. Photo Tip: There are small roads down in the valley, outside the old city walls, where you can see Assisi on the hill. You can easily park on the side of one of these roads for a few minutes to take a photo of the entire city from a distance. At the top of the hill, is the Basilica di San Francesco (seen in the cover photo). The church is actually divided into two churches (Upper/Superiore and Lower/Inferiore). It is the largest structure in town and easy to find. Once you reach town, just start heading West (or for me, to the left of the parking garage), to the edge of town. The Basilica is a UNESCO World Heritage Site. Its construction began two years after St. Francis died when Pope Gregory IX laid the first stone in 1228. The Lower church holds St. Francis’ remains, preserved in a tomb in the back of the room. Visitors can walk around the tomb or kneel and pray in its presence. The walls and ceilings of the lower church are ornately decorated and painted with beautiful frescoes, with the ceilings mimicking the night sky. No photos are allowed (and I’m no rule breaker) so you’ll have to take my word for it (or click here). The Upper Church is plainer in decor, even with its 28 frescoes, and feels much larger with its high ceilings. The Altar is flanked by wooden chairs carved into the walls where the Cardinals and other church official sit during services. You can enter the courtyard, behind the church, from stairwells on either side of the altar. Once outside you can take photos of the Cloister of Sixtus IV. Entry to the church is free, but you have to pass through security (a quick glance in bags and metal detector wand screening) before you can explore the grounds. The entrance is located at the lower church and you’ll exit above near the statue of St. Francis on a horse. St. Francis is celebrated in Italy on October 4th. It was no wonder that the Basilica, and the entire city, was crowded the Sunday that my husband and some of our guests visited Assisi. Scores of people flocked to the Basilica for mass and many of them brought their pets with them for a blessing. St. Francis is the saint of animals (among other things), hence the animal blessings. Although I was sad to miss all the puppies, I wasn’t upset about missing the crowds. By Tuesday, the streets were sparse, with the exception of the basilica and Piazza del Commune. To find out more about St. Francis and his connections with neighboring cities, check out my post on Gubbio. Photo Tip: (1) After you enter the church grounds, head to your left where there is a large open area (Lower Plaza) and a long covered walkway. Here’s the best spot to capture the majority of the church and its different architectural aspects into one photo. (2) When you leave, head up the hill to take a picture of the front of the church with the valley in the background, or olive trees in the foreground. When walking down the Via San Francesco towards the Basilica di Francesco, the Oratory of Pilgrims can be spotted by all of the potted plants hanging on the exterior walls. This chapels hosts magnificent frescoes and acted as a hostel for those making the pilgrimage from Rome to Assisi. One of the Main plazas is Piazza del Comune. The square gets its name from “platea comunis” or “the place where people gather”. It’s likely that the story of Francis giving up his clothes and money to his father occurred in this square, as it happened in a public place in front of his father, the bishop, and a crowd. It is said that Francis, in his youth, was spoken to by God to help repair a dilapidated church where he used to pray. He took some of the cloth from his father’s business, sold it, and gave the money to the bishop. His father, outraged, demanded the money be returned (he even filed a complaint against him…read on for more tales of his strict father). The Bishop kindly returned the money to Francis, who decided to only recognize God as his father from that moment on. He threw down the money and stripped naked in the square so he could return everything that belonged to his former father. This main square is where the Tempio di Minerva (Temple of Minerva) is located. Before it became a church, between 1212 and 1456, it was the Palace of the Podestà of Assisi. In 1539 it was transformed into the church of Santa Maria Sopra Minerva. During the 17th century, the building was renovated in the Gothic style, leaving only the columns from the Roman structure. On the left side of the church is the Palazzo del Capitano del Popolo, the first public building built in the square, between 1212 and 1305. The tower on the left was completed in the early 1300’s and there is a plaque on the walls near the entrance. The Three Lions Fountain was added to the square during the 16th century. This church is dedicated to St. Rufinus, but like most places in Assisi has a tie St. Francis. Story has it that he was baptized in this cathedral (along with Saint Clare, see below for more info on her). The church was built atop an old Roman forum (or possibly a pagan temple) in the 13th-century. During restorations in the 11th century, a crypt was created below the church. You can still see remnants of it through glass tiles in the floor. The Basilica di Santa Chiara is located in the Piazza Santa Chiara. The church is dedicated to Saint Clare. The decorations inside the church are fairly plain, compared to a lot of churches in Italy, but that’s okay because all of the interesting stuff is downstairs. There is a mini museum displaying articles of clothing and other items from St. Clare and St. Francis’ lives. What’s most interesting is the tomb of St. Clare. The story of Clare is transcribed along the walls with the tomb in the middle. When Clare was 18 years old she fled an arranged marriage and joined St. Francis and his newly formed group of friars in Porziuncola. Francis cut her hair as a sign of her penitent condition, and you can see her hair in the mini museum. Later in her life she founded the church of San Damiano, where her mother and sister joined her, the beginning of the group of sisters known as Clarisse. Clare died in the mid 1200’s after loosing a battle with a long-term illness. If you like my husband’s sunglasses, check out the affiliate link at the end of this post! Strolling down Via Borgo Aretino will lead you to the Porta Nuova (gate in the city walls). Built on the site of Francis’s family home, this church is another in town with a special connection to the saint. There was a small medieval church on this located as far back as 1398. The church we see today was built by order of King Phillip III of Spain in 1610. Below the church you can visit rooms that belonged to Francis’ family home, most likely his father’s shop’s storage area. Inside the church is the “prison” where his father locked him up for renouncing everything. (His father was a wealthy merchant and was probably not pleased when his son decided to forgo the family business for a life of poverty). The statues in the plaza outside the church are of Francis’ parents, Pietro and Pica of Bernardone. Photo Tip: This is another church where you are allowed to take photos inside. Be sure to go down the steps near the altar to see remnants of the family home. The church is also located nearby one of the restaurants I recommend at the end of the post (Medio Evo). Rocca Maggiore is a Fortress was built around 1174. It’s about a 20 minute walk from the city center and is located at the end of Via della Rocca and Via del Colle. When visiting the Fortress walk toward the Rocca Minore (a single tower) at the end of a long wall. The climb to to the top of the tower for 360 views of the city is not for the claustrophobic. There is a narrow spiral stair case, and nearly everyone feels the burn when climbing these steps to the top. If you plan on venturing outside of the city, find the Porta Cappuccini, where there will be signs pointing you toward the Eremo, 4 km away, and a climb of some 250 meters. The Eremo delle Carceri (Hermitage of Prisoners) is a “cave” where St. Francis would retreat or imprison himself away from worldly temptations. Today there is a convent and small chapels built above the cave for the friars who guard the shrine. From the convent, there is an archway marking the entrance to a woodlawn path to and from the small cave which has an altar inside. Note: the Eremo is located outside the city. (1) Ristorante Medio Evo – located on Via dell Arco dei Priori. Check out their website, here, for information about their menu and location. We ate a delicious meal here near the end of the lunch hour so it was nearly empty. We ordered the suppli (highly recommend ordering this while in Italy) and a tray of meats of cheeses to share. I had the Fillet of beef with a “Sagrantino” wine sauce and mashed potatoes and it was very tasty. (2) Trattoria Pallota – located on Vicolo della Volta Pinta n. 3. Our group was sad to discover the restaurant was closed on Tuesday so we found Medio Evo instead. The group of guests who visited Assisi on Sunday ate at Pallota and recommended it. You can visit their website here. Have you been to Assisi? What are your places to visit or eat? Share in the comments below!